How do you keep a car-park interesting? 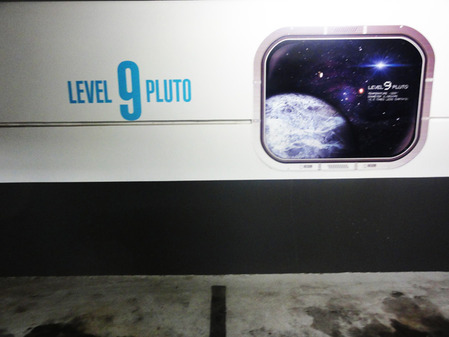 Well when you've got nine levels of parking spaces it seems the obvious answer is to throw in a bit of space travel. The EziPark Flinderslink Car Park, on Wyatt Street in the city, has 9 levels each dedicated to a different planet in the solar system (even faux planet Pluto gets a mention). Pick your favourite planet to park on and then head down in the elevator, whose voice commands sound like a dalek invasion is imminent. Apart from a few bit of signage, the car-park doesn't really have too much to offer; there aren't little green men walking around with ray guns, but when most other car-parks are so boring why not choose something a little bit more fun. The Flinderslink Car Park is open 6am till 8pm on Monday, Tuesday, Wednesday, Thursday, and Saturday. On a Friday it stay open till midnight, and on Sunday's it's 10am till 6pm. Are you serious? I was wondering how you have so many articles to your name, now I know. I'm sorry but this is a waste of time.